Rising Indie-Americana singer/songwriter Aly Aleigha released her first EP “Jealous Love” in 2015. 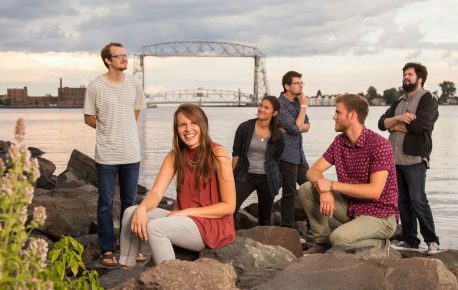 Starting as a ragtag group of musical friends playing local gigs (such as the Homegrown Music Festival in Duluth), they have since been swept up in a whirlwind of recording her full-length album “The Labyrinth” (2016). The group’s eclectic, alternative-folk sound and profoundly allegorical lyrics received national attention immediately; the band was invited to perform at a major music festival in Pennsylvania the same month the album dropped. There Aly Aleigha received the “2016 Emerging Artist Award” sponsored by Relevant Radio and AbbeyFest. Since then, the group’s music has continued to rise and strike the hearts of listeners everywhere as they tour around the USA with Aly’s original music. Inspirations for their sound include groups like The Head and The Heart, The Oh Hello’s, Josh Garrels, The Lumineers, and We the Wild.